← Monday Question – How Do You Feel About Decants? What was previously and primarily known to me as the home town of J.R. Ewing and his posse, is now the city that is famed (in Perfumista circles at least) for being home to Aldehyde 44, not living on Sourthfork Ranch but the local Le Labo store. Aldehyde 44 is only available in Dallas and nowhere else in the world. Nothing against Dallas, but what does Le Labo think how many people are ever going to Dallas??? I can understand (if not like) the fact that there is such a thing as a limited edition, or even limited distribution. Localized releases, when Paris or New York are involved, add to the interest and covetability a perfume engenders. And chances are that cities like London or Los Angeles are on one’s itinerary sooner or later. At the very least, one knows other perfume-interested people living there and willing to shop and ship. During the month of November, Le Labo has decided to make their location-specific offerings available to the public at large through their webstores as well as Luckyscent. Friendly as the folk at Le Labo are, they offered the opportunity to buy samples of all the city-exclusives through the same outlets as above, ahead of the limited timeframe of availability. So yours truly got in gear and ordered one of each. 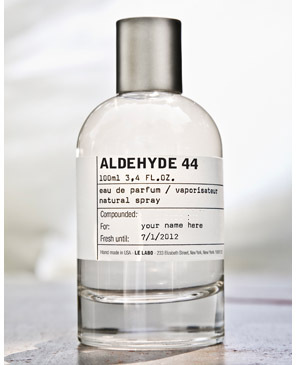 Aldehyde 44 was created by Yann Vasnier and includes notes of narcissus, neroli, jasmin sambac, tuberose, vanilla absolute, ambrettolide, muscs and aldehydes. You know, I don’t particularly care for aldehydes. At all. I realize their impact on perfume history, when Ernest Beaux decided to add them to the classical structure of a traditional floral and created an icon that changed the fragrance world forever. But I don’t need, want, desire or crave them. I find them sharp and harsh and soapy most of the time. Aldehyde 44 is no different at first, the first twenty minutes are not my favorite in the world, and I basically have to sit it out. What’s more, the aldehydes in Aldehyde 44 never entirely leave the scene. A low key, and much more manageable as well as likeable level, stays thoughout the entire wear time of the perfume. The floral notes, a well blended mix of jasmine and tuberose, is infused with bubbles, like a carbonated drink. The entire structure lies on a solid base of wood that is there from the beginning as well, just getting deeper and darker over time. I really enjoy the drydown, when the bubbles are almost gone, and the wood is most prominent. Then I am reminded of a great perfume the house of Chanel created – N°22. Another perfume that comes to mind is Sonoma Scent Studio Champagne de Bois, the softly sparkling aldehydes on a woody base are similar. Aldehyde 44 is an interesting scent, a modern, see-through composition where everything is there at once, it is clean and clear and glassy. But it is also warm and soft and deep. This apparent contradiction is what made this perfume more and more irresistible, the better I got to know it. I think it is safe to say that I won’t be trekking to Dallas anytime soon, but I am glad to having had the opportunity to try Aldehyde 44, thanks to Le Labo’s nice, if temporarily limited offer. See, Le Labo, that wasn’t so hard now, was it? This entry was posted in Aldehydic, Floral, Le Labo and tagged Dallas, floral, Fragrance, Le Labo, Perfume, Review, Yann Vasnier. Bookmark the permalink. Thank goodness Oud 27 and Patch 24 are not exclusive. I would be a sad girl if I had never met these two. I’m not a fan of aldehydes either and there are so many divine non-linear scents out there, so no loss to me on this one. Hopefully the reviews of the other exclusives don’t send me on a craving frenzy! I tried to be neutral, but I must say I really like Aldehyde 44 by now, enough to get in on a split for a small amount. I’m so excited about you reviewing the city-exclusives, B! I also have a problem with aldehydes but the contrasting elements within Aldehyde 44 sounds interesting. Really looking forward to reviews of Vanille 44, Baie Rose 26 and Gaiac 10, in particular. Oh and for anyone living in London, apparently all the city exclusives will be available at their flagship store on Deveonshire Street and at Liberty from 1st Nov.
Gaiac 10 is up tomorrow. I can’tt hink of a name that would have put me off more than Aldehyde, therefore I was really surprised how much I liked it. Thanks for the reminder that the perfumes are at the physical LeLabo stores in November as well of course. I am that rare bird – a person who has been to Dallas! Not as a perfumista, mind you, and in truth, I am unlikely to go there again, whether by accident (as in the previous instance) or design. Earlier this year I smelt Baie Rose 26 in Chicago (quite fortuitously) and remember thinking that this city exclusive business is all such a silly system. Fortunately, my beloved – loud but beloved! – Labdanum 18 is in general circulation, and I will bear in mind Tara’s tip off about the Devonshire St store. I don’t go a bundle on aldehydes either, though bizarrely I have a bottle of Le Dix, which has a ton of them in, and also own Ines de la Fressange, which is moderately fizzy. But consistency was never my strong suit. Probably wouldn’t go out of my way to try this one, which is just as well, given the long list of other stuff you have reviewed lately that I have still to get to! Hey, fellow bird! I didn’t say I hadn’t been to Dallas! 🙂 But that is my point, I’ve been there once, I won’t get the chance (or the wish) to go back again. I’ve seen the original Southfork Ranch, who knew I missed the Le Labo store? Never been to Dallas. Still don’t know why champagne-bubble aldehydes are associated with it. Yes, you are! 😀 It is a really pretty perfume, aldeHo or no! This Fort Worth girl is going to have to point out to the rest of y’all that the population of the Dallas-Fort Worth Metropolitan Statistical Area is 6,371,773 according to the 2010 Census. That’s roughly as many people as in Bangkok or Chicago. Though it will never have the international cachet of, say, Paris or London, Dallas is sort of like Los Angeles on the prairie. Very different from the rest of Texas. Image is everything in Dallas. Women and men alike are very slick, well-dressed, and polished, drive flashy cars, and live in trendy expensive neighborhoods. There’s been a Barney’s at North Park Mall for 30 years to cater to such folk. I’m moving from stinky hippie Austin back home in two weeks (for work) and one of my first errands is a trip to Barney’s to smell Aldehyde 44. Among others! Lucy, I hope you are not put out because of the Dallas banter! I liked the city when I visited and my real issue is with Le Labo and their exclusive marketing policies. Well, I’m with Mals — I love aldehydes and would probably like this from the get-go. But since I have a good number of aldehydic fragrances in my collection already, I’m feeling satisfied that I don’t need to explore this one. The Le Labo I’m the most curious about is Poivre 23 … can you give a hint as to how that one grabbed you, Birgit? You would surely appreciate nit only the aldehydic side of Aldehyde 44, but also the dark, woody base. It reminds me a lot of Chanel 22 which I believe you like a lot. I’m not sure how I feel about aldehydes. I love Champagne de Bois, but I can hardly detect them there! And Bois des Iles, but the topnotes are my least favorite part. Not dislike— just least favorite of the whole. I’m not tempted to try this one; there is already a Le Labo exclusive in my HG collection, and I don’t need any more! I love Champagne de Bois too. The aldehydes in Aldehyde 44 are somewhat similar in feel – after the first half hour, that is. B, I’m with you: every time when I read exclusives by cities I stumble over this one. Dallas??! Really?.. My two favorite Le Labos are Rose 31 and Iris 39 – thankfully, the regular edition. I’m still working on several other samples but I’m not sure if I need any of them – we’ll see. I will go to the Le Labo counter at the local Barney’s in November to try all of the exclusives. I really hope that either I won’t like any of them or at least there still will be space left in one of the splits to buy a decant of those I like since I’m not paying for the full (ugly!) bottle of Le Labo. I’m very curious too about Poivre 23 (most of all, because I read many positive things about that scent from the same person who makes visiting Austin desirable) so I’ll be looking forward to your review next week. My favorite Le Labo is Labdanum 18, thankfully in the regular collection too. Le Labo is ideally suited for splits, since they offer those huge 500ml bottles. A godsend! Undina, are you in San Francisco? (Sorry, I forgot!) If there is a Le Labo counter, we can look forward to a SF exclusive in the future, I guess. Well, I live in Dallas and have no plans of trying our city exclusive. I have yet to find a Le Labo scent that I like. Unfortunately, I find most of their scents to be a very expensive, weird concoction of elements. Now that sounds like my kind of ‘fume! 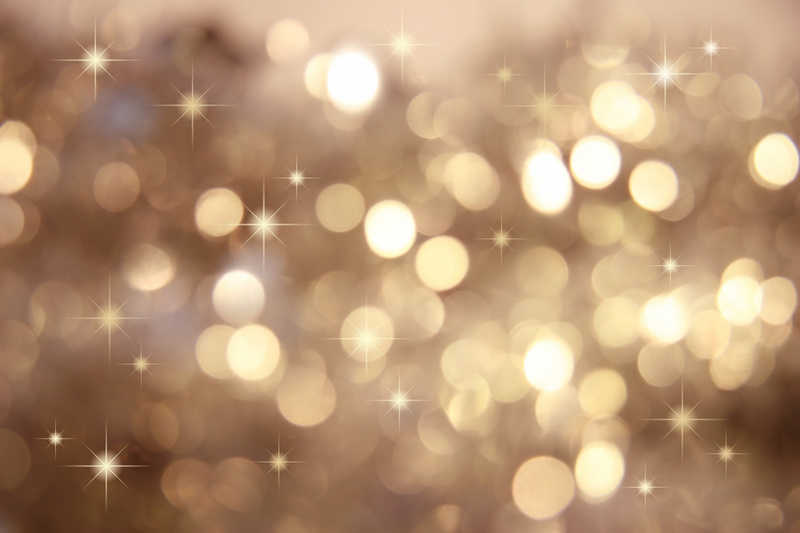 I love all things sparkly and out of all of the city exclusives it seems the most interesting. Thanks for the review! From the ones reviewed this week, it is surely the most interesting. I’m wearing it right now actually, and I really love the drydown, hmmm.